There is no longer a JWstream and no Pontu archive this year! It seems to be a new nest site at Tukums district, Pure parish. It was found on 11th May 2016 by ornithologists Lauberga Arthur and John Betinsh. It already contained five eggs. Incubations starts right away so hatching of chicks can be expected at intervals of 2-3 days after about 25 or 26 days after laying the egg. A normal clutch of Bittern consists of 3-7 eggs. Thanks, Hagnat, for posting the link, that's really uniquei! Where is this webcam please? It's one of the new Latvian cams. Over 20 bird species on the first day of Bittern Cam. Not bad. Because of its rarity and special nature I think it is deserving an own topic. I already had searched for it. I'll be looking into this in the evening, being at work now. In Latvian, of course. Many people mix these two countries. Would be nice, thank you very much! Last not least (!) a big thank you to Hagenat for the link to the beautiful video!!! vainamoinen wrote: In Latvian, of course. Many people mix these two countries. Of course. Excuses to everyone who feels offended. 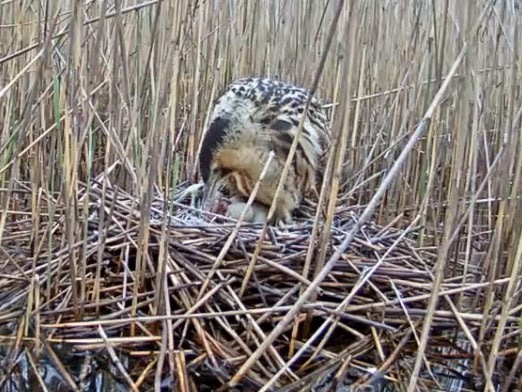 The Bittern had three eggs on the 24th of April. After that the fourth egg was laid. Laying with intervals of 2-3 days. Breeding starts with the first egg and incubation time is 25-26 days. Yes, there is a hole in the egg! I haven't seen that and she doesn't act like it. This morning she left the nest alone for almost 30 minutes. Thank You very much for bittern camera. All Latvian and Estonian cameras are very good, but this... I never could even dream about opportunity to observe this so great, so interesting bird. This camera gives us a chance to get more knowledge about bitterns. Greetings and great thanks from watchers of Lithuania! I didn't know for example that they do so much fishing from the nest. It was surprise also for me. But this is a bird with very concealed lifestyle, so unexpected moments could be rather much.